The courtier depicted here is Minamoto no Yorimasa, an acclaimed poet and heroic warrior of the 12th century. His best-known exploit is the killing of the mystic beast 'nue', a composite creature that has the face of a monkey, the body of a badger, a tiger’s paws and tail, and a snake’s head at the end. 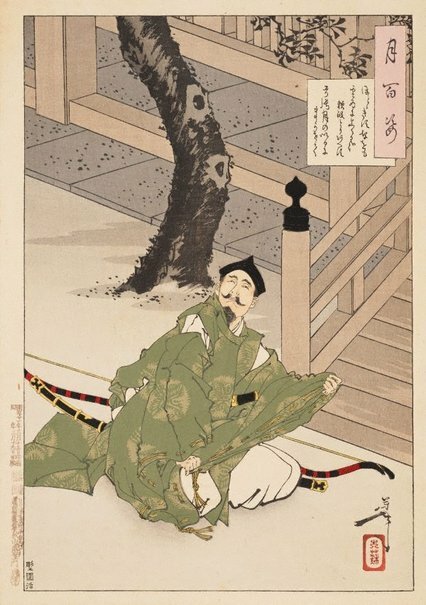 The 'nue' disturbed the emperor’s sleep with its shrieks and Yorimasa succeeded in shooting it down with a single arrow. The incident is included in the epic ‘The tales of Heike’ and dramatised in the nō play 'Nue'. The moon is not included in the design, but the shape of Yorimasa’s bow and his gaze upwards hint at a crescent moon.